Back-of-the-card special: The backs of baseball cards used to feature tiny print on colored cardboard, detailing a player's career stats, height, weight, hometown and a few season highlights or nuggets about the player himself. But in the early 1990s, Upper Deck and a handful of other card companies decided it would be a good idea to feature a second photo of the player, as well as the statistical information. 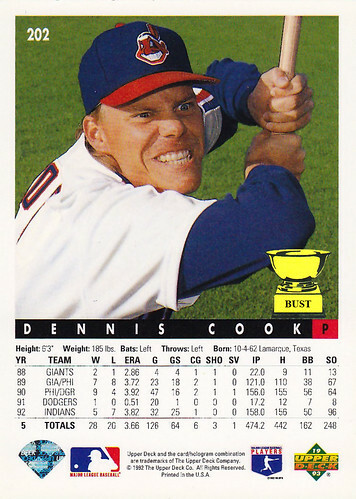 Thus, we got to see what Dennis Cook would look like shortly before he bashed in our skulls while growling and laughing maniacally. Thanks, Upper Deck. Now I won't be able to sleep tonight. More back-of-the-card gems: There's this Skybox atrocity. There's Jeff Nelson's Kenny Powers impersonation. And then there's the worst sports card ever. that is totally awesome. he was actually a pretty good hitter for a pitcher. Career .264 average, and one of his 2 career homers was off of Fernando Valenzuela.